Greek Island holidays were top of the list for family getaways when the kids were young. I have memories of sunny, cloud-free days spent exploring Rhodes old town, dipping into warm turquoise seas around Corfu and of sleek dolphins slip-streaming the boat during a trip from Skiathos. But that was a long time ago. Too long ago, and a day excursion to Mykonos and Delos during a cruise last year got me thinking that it’s time I gave the Greek Islands some proper attention again. So, last month I did. Me and Mr Jones spent a blissful week in Crete, Greece’s largest island, with James Villas. We stayed in a villa in Rethymno, a ridiculously pretty Venetian town which lies half-way between Chania and Heraklion, nestling between the Mediterranean Sea and the foothills of the White Mountains. So what did we see and do in Rethymno? Rethymno (or Rethymnon) is everything a Greek town should be and more. 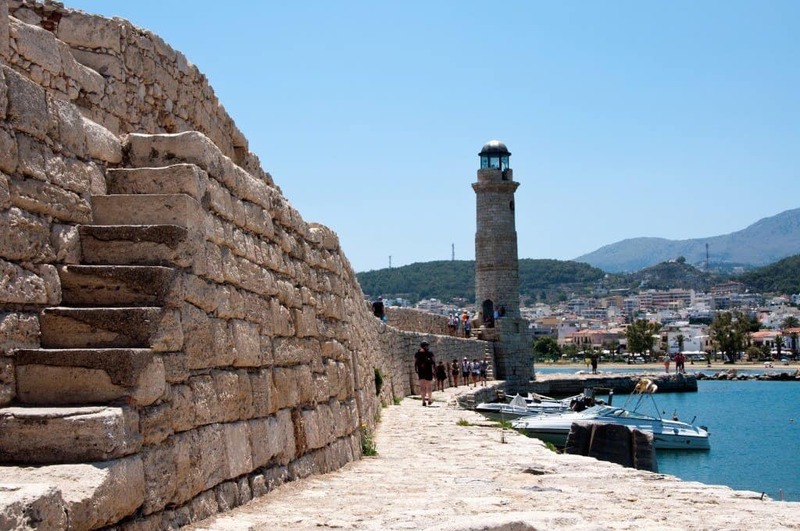 It’s one of the best preserved medieval towns in Greece and was once a bastion of the Venetians who left a mighty legacy – the large Fortezza (fortress) which guards Rethymno from the top of an imposing headland. 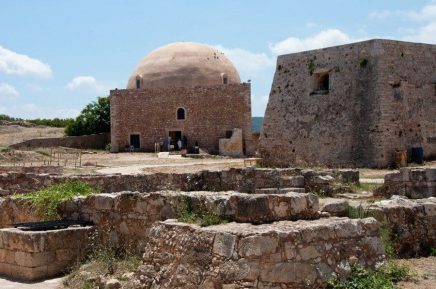 The town was also ruled by Turks for a time so you’ll find a scattering of Ottoman domes and minarets peeping from behind 16th century buildings. In the town there’s a honeycomb of cobbled alleyways dappled with vines and bougainvillea. 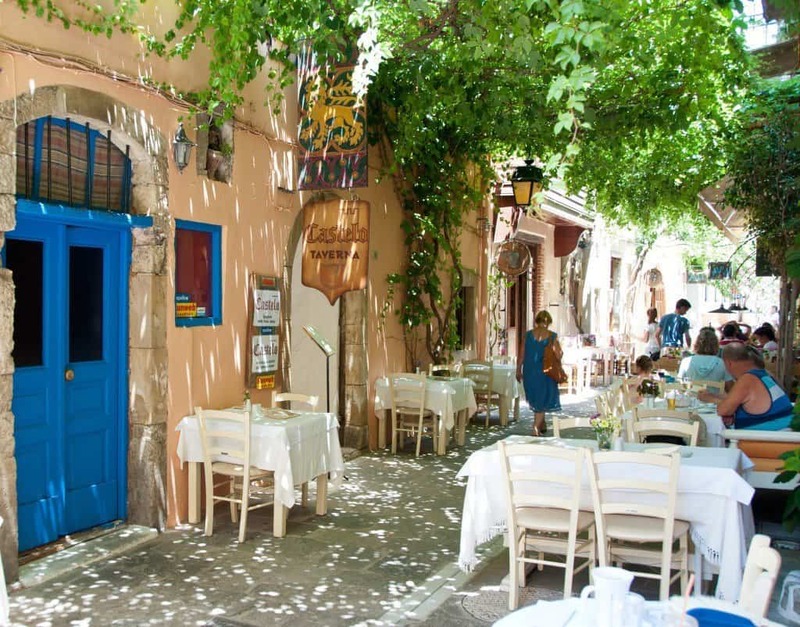 They’re lined with cute cafes, shops selling local crafts and restaurants dishing up the best of Cretan eats. Ancient doorways and arches in mellow stone walls lead to enticing courtyards and 16th century buildings and churches line pretty plazas. There’s a stylish side to the town with contemporary restaurants, cafés and bars. The newly developed part of town has a vast sandy beach which gently slopes into the sea. It’s lined with hotels and restaurants and stretches east for 22km to Panormo – the contrast of new and old makes it the perfect base for both families and couples. 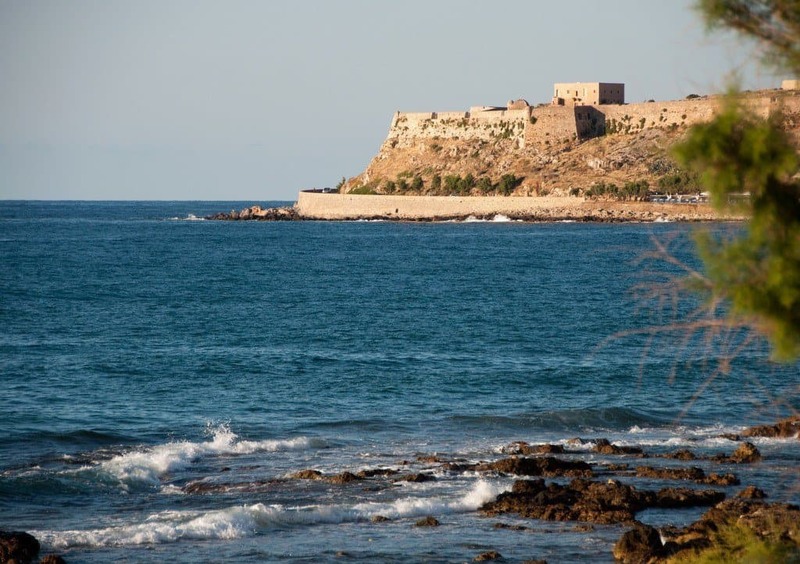 The walled Venetian fortress was built in 1573 high on the rocky hill of Palaiokastro overlooking Rethymno. 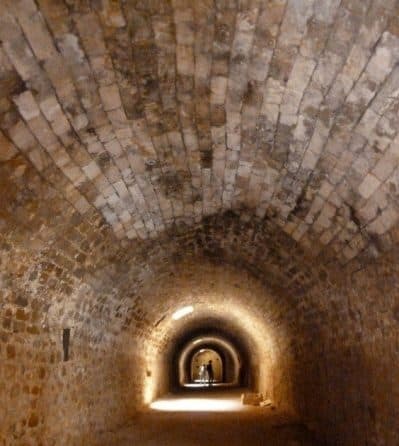 You’ll need at least two hours to explore its bastions, ramparts and underground munitions vaults. 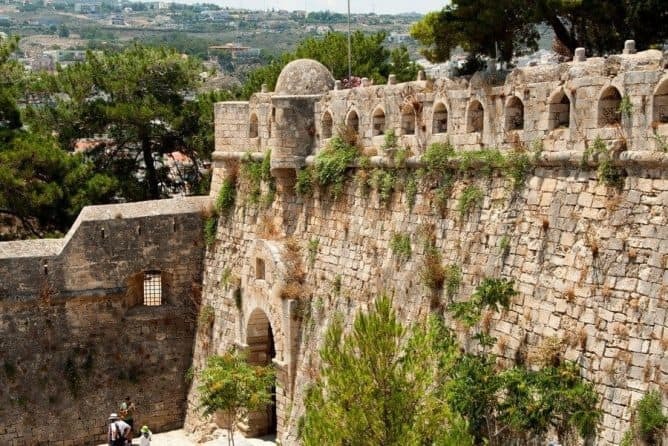 The fortress was built to protect the town from pirates and Turkish invaders. On day 22 of a siege the Turks invaded and penetrated the fort. 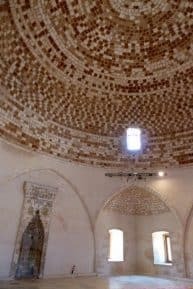 They turned the old church of St Nicholas into a mosque – go inside to see the lovely dome and mihrab which is niche that points towards Mecca. 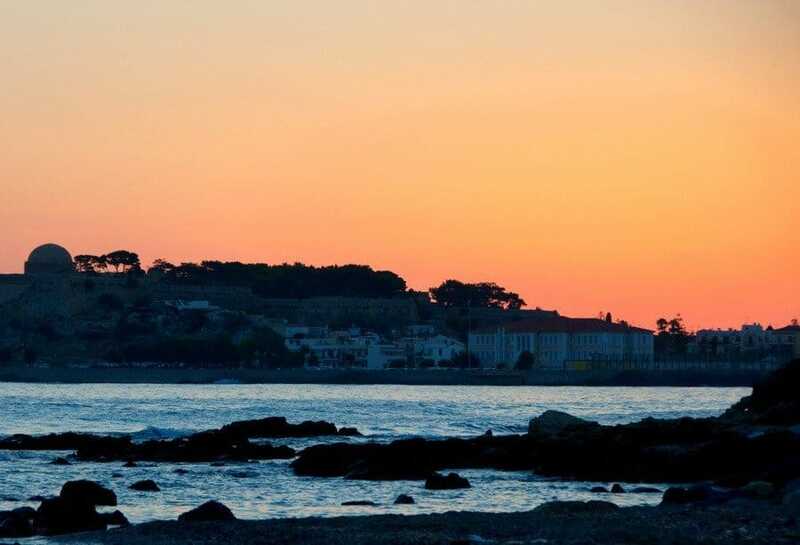 The fort has panoramic views over the town and it’s the perfect spot to watch the sun set into the horizon. If you fancy a sundowner to go with your sunset you could bag a table at ‘Sunset Bar’ by the sea wall below the fort. When: The fort is open daily from 08:00 – 20:00 hrs Cost: adult/senior/family €4/3/10. 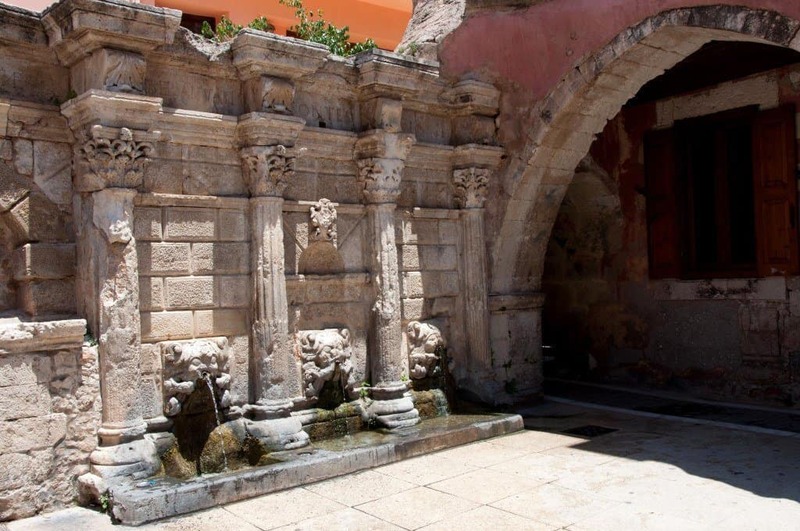 The Rimondi fountain can be found in Petychaki Square in the centre of the town. It was built in 1626 by the city rector (of the same name) to provide the people of the town with drinking water. Flanked by Corinithian columns the water flows from three lions’ heads into three basins. The Rimondi family crest can still be seen above the lion heads. Take a stroll past the colourful fishing boats and along the harbour wall to the honey coloured lighthouse. Built by the Turks in the 16th century you’ll see carved symbols near the top if you look closely. 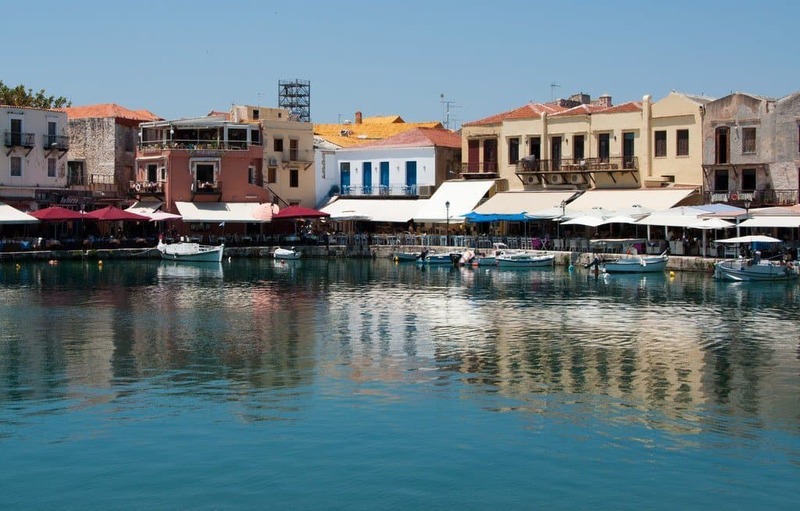 The historic harbour opposite is lined with fish restaurants, waterside tavernas and cafés. A walk past these alongside the water will have the owners trying to drag you in to eat or for a drink. The other restaurants in the town’s alleyways aren’t nearly as pushy or pricey but the views of the harbour here are pretty. One of my favourite things to do any any town historical centre is to just wander and soak up the atmosphere. 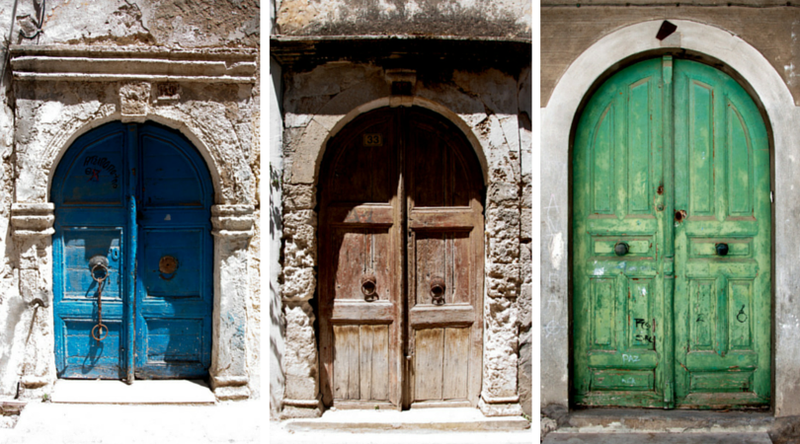 As we strolled through the town we saw some wonderfully rustic old doors – I have a bit of a thing about old doors and windows! Shop windows opened out onto the alleys where the smell of freshly baked spanakopita (pastry stuffed with spinach and feta cheese) and baklava tempted us more than once! Read about Crete’s best eats here. Souliou street is the place for souvenir shopping with lots of jewellery and artisan crafts. I bought a gorgeous beach dress in the linen shop. There’s a variety of herbs, soaps and lotions made from olive oil and there’re shops selling pottery, Cretan herbs, honey and oils. Not all the churches were white – we found this sunset coloured church on the road just outside the old town. We saw some fabulous sunsets in Rethymno but this shot is of the sunrise from our beach front villa – I had this all to myself! We didn’t feel like heading further afield as the town had more than enough to keep us busy and the villa where we stayed was fab. There are local attractions nearby if you want to explore a bit more. Mili Gorge is about 7 km outside Rethymno by car/taxi (or the red city tour bus) and perfect for a hike in unspoiled countryside. The 4k walk will take you through olive groves and citrus trees, along steams which used to power the now deserted watermills (hence the name Gorge of Mills). There were once around 30 mills supplying the area with flour, a number of churches and there’s a tavern which has been renovated by one of the original owner’s descendants. 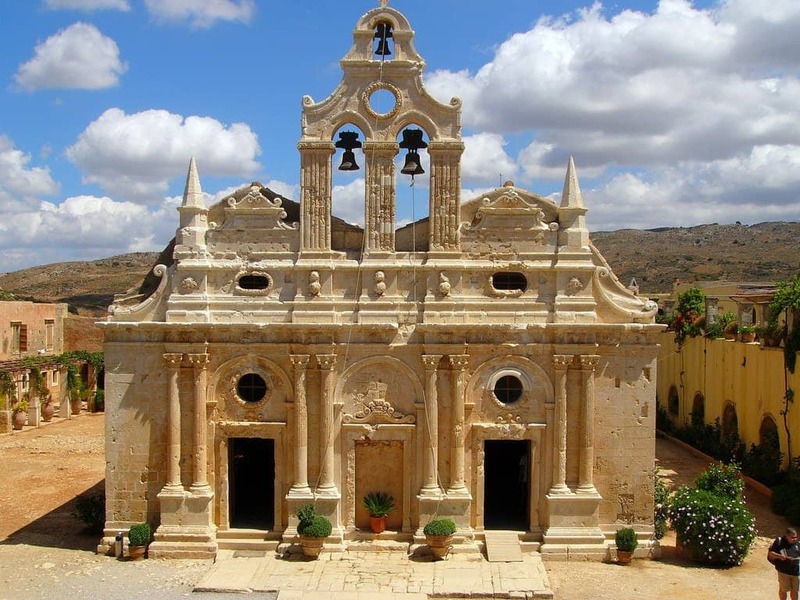 The monstery is around 23 km south-east of Rethymno and was built in the 14th century. A Byzantine church stands in the centre of the complex. 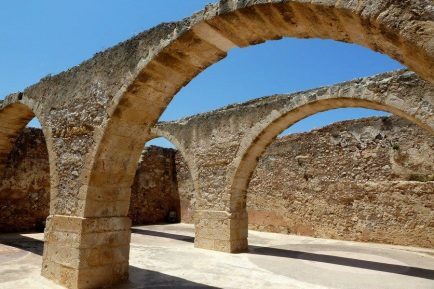 The monastery is the most important in Crete due to a Turkish siege in 1866 where the Cretans refused to surrender and set fire to the gun powder store blowing up both themselves and the Turks. It seems the Cretans and the Turks have a colourful history. Buses go daily from Rethymno 10:30 and 14:30 and return 12:00 and 16:00. Greece is going through some pretty turbulent times at the moment but we didn’t notice anything untoward during our visit at the end of June. We took Euros with us in case there were problems withdrawing cash so we didn’t try out the ATMs. The restaurants we went to were happy to take credit cards although that my have changed by now. As always the Greek people were so friendly and welcoming. 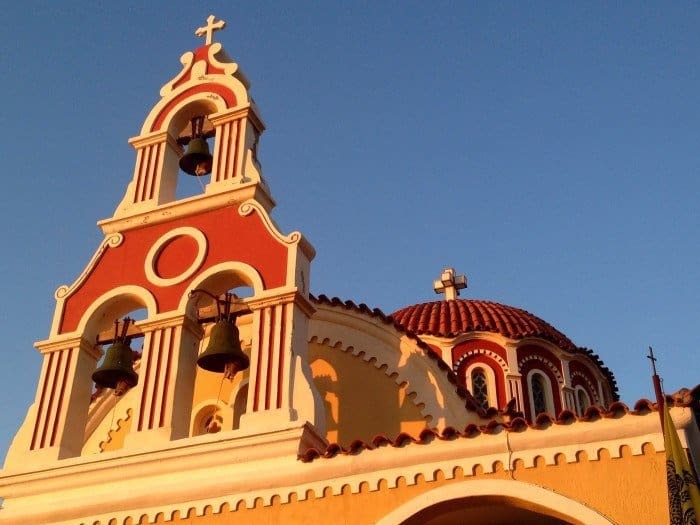 Have you to been to the Greek islands? Do you have a favourite? 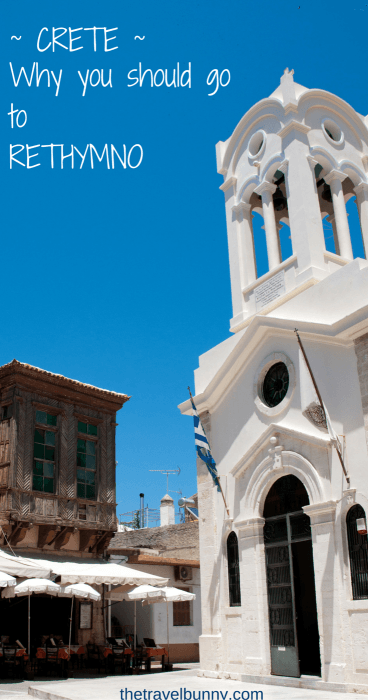 We go to Crete every summer (so much to see and enjoy) and Rethymno is a stay every other year. These pictures are beautiful. Thank you! I love the Greek islands – this was my first time in Crete and I’ll definitely be going back again. 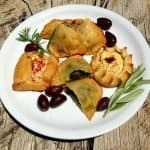 I love the Cretan food too! I’d be happy to drop everything and be back there right this minute! It was my first visit to the island and I loved it – hope you get to visit soon! Stunning!! This sunset and the ocean are reason enough for me to go there. Such a pretty village… funny because this week I watched a movie that was set there 😀 Two faces of January I guess! That’s spooky! I’ll have to check out that film – was it good? Rethymnon was our base for a fortnight about 14 years ago, Suze. I remember fancying Chania but that was even further from the airport so we made do with a day visit. And to lovely little Georgiopoulis too (which I understand from friends is still very chilled and peaceful). 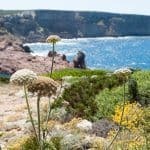 We did part of the Samaria Gorge and south coast too, and I thought it the loveliest island. We had a favourite restaurant in the harbour and watching the antics of the waiters kept us well entertained. I am so happy to see your post on Rethymno! I was just on Crete for 6 weeks and Rethymno was really my favorite city and region on the entire island. Such a pretty city, with lots of energy! Thanks Katie – we had just a week but really enjoyed the town. How did you find the food? We loved it! I adored Crete. I had the best kebab of my life there. I would love to visit this part as well. Thanks for the tips. We didn’t try any kebabs – wish we had now! I haven’t yet been to the Greek islands but would love to visit Rethymno and see the sunset at The Fortezza. Did you come across any great restaurants? Like you, I went to Greece last year for the first time in ages and thought to myself “why don’t I come here more often?” I’ve missed the boat this year (I’m more skint than the Greek banks), but would definitely consider Rethymno next year. This does look wonderful! I’ve been to Crete a couple of times but many, many years ago and would love to go back. Never made it to Rethymno so now have even more reason to return. I don’t think as many people go to Rethymno because it’s an hour from Heraklion and a little more to Chania airports so people usually go to resorts nearer the airports – they’re missing out!